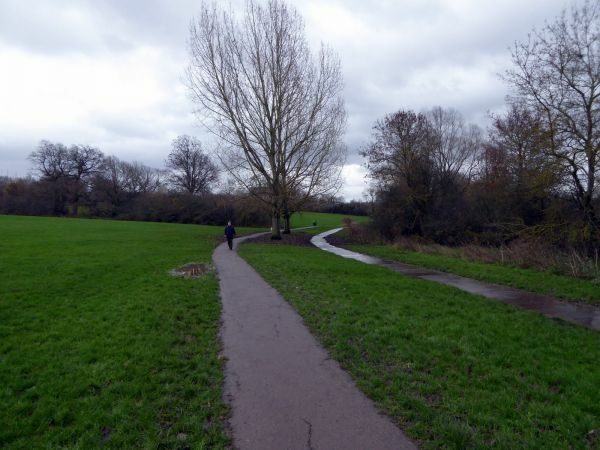 Dollis Valley Greenwalk is a 10-mile riverside walk from Mill Hill to the northern fringes of Hampstead Heath linking areas of public open space along the valley of the Dollis Brook, a tributary of the Brent, that rises near Arkley. It passes through Moat Mount Nature Reserve, Barnet Gate Wood, an ice age forest remnant, Totteridge Fields, and under Mill Hill viaduct. It provides many habitats for plants and other wildlife. Spot colourful flashes of the Kingfisher in Finchley or Ragged Robin in Brook Farm open space. Most of the route is moderately flat and surfaced, and is suitable for wheelchairs and pushchairs. The path is waymarked with white direction arrows on a green disc. It is designed to link with the public transport system, and also links the London Loop with the Capital Ring, and is coincident with each for part of its route.